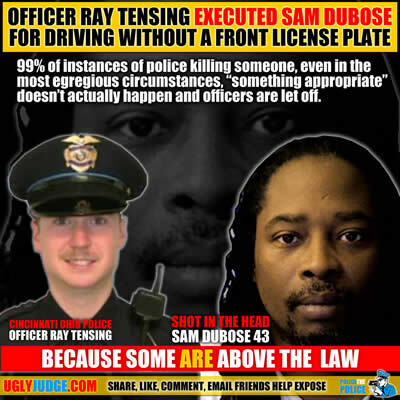 After a routine traffic stop by a University of Cincinnati Police Officer, Sam Dubose is dead with his face blown off. The officer was wearing a body camera, but the city refuses to release in the video. Everybody who sees it is deeply disturbed, including the citywide police chief. The truth hurts and police don’t want you to know what they’re doing. Before a University of Cincinnati officer shot Sam Dubose in the head Sunday night, he was pulled over for a missing front license plate on his vehicle. That traffic stop led to a struggle over Dubose’s car door after the 43-year-old refused to exit his vehicle, UC Police Chief Jason Goodrich said at a news conference Monday. Goodrich said Monday Dubose was without a driver’s license and had an open bottle of alcohol in his vehicle when Tensing pulled him over. Goodrich said Dubose and Tensing struggled over his car door before Tensing fired his weapon.